ALEXANDER DE VILLA DEI and Johannes SYNTHEN. [Doctrinale part 1, with the commentary by Johannes Synthen]: Glosa super prima parte doctrinalis Alexandri. Per Joannem Synthen Daventriae extremo labore collecta. Deventer, Jacobus de Breda, [between 5 April and 21 May 1490]. 4to. With only 2 initials executed: first chapter: a red R with red pen work and a red V at the beginning of Chapter 5 (damaged). Lacking 4 leaves. 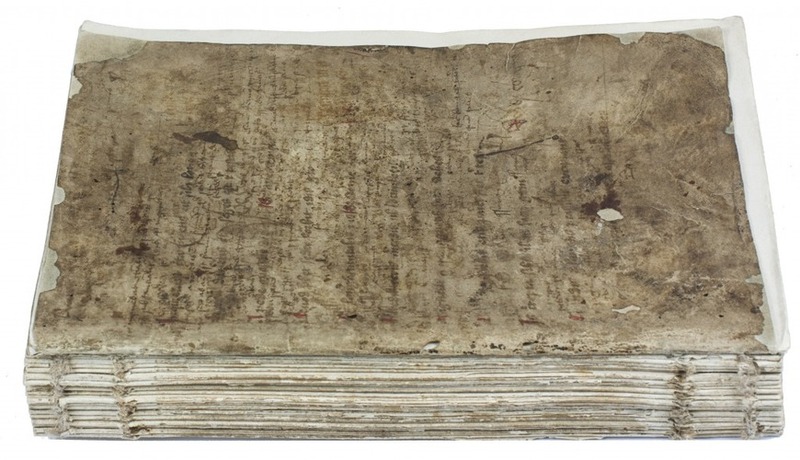 Binding lost except front cover: a vellum leaf from an early 15th-century rhetorical manuscript, rubricated in red. 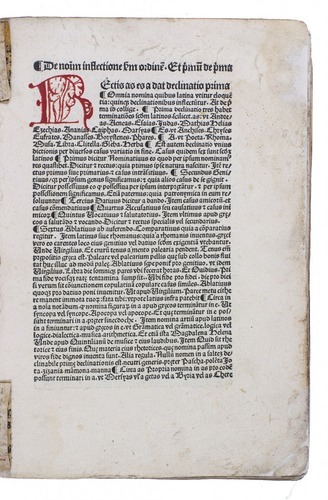 One of the rare incunable editions printed at Deventer of the first part of Alexander de Villa Dei's Doctrinale, with the authoritative and extensive commentary by Johannes Synthen (died before 1493). Synthen taught in the domus pauperum during Erasmus's school years in Deventer and probably knew him well. 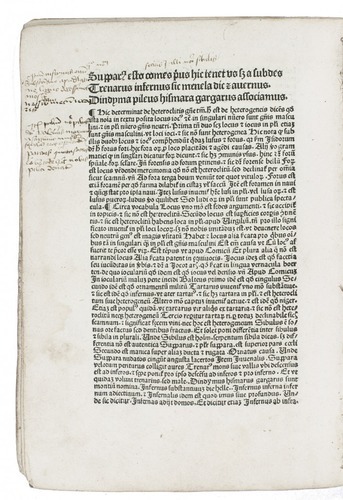 This commentary, mostly the work of Synthen, enjoyed a certain authority in educational circles and was reprinted at least 10 times before 1500 in Deventer alone. 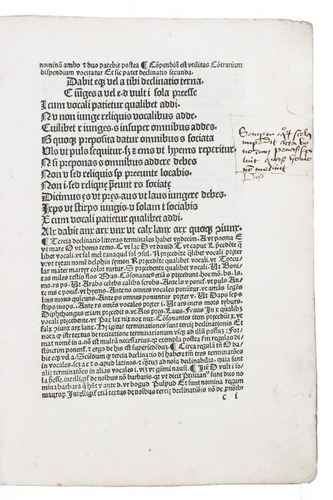 The text together with the commentary was first published by Richart Pafraet in 1477-1479. The present copy, recorded in the literature as Lansberg-Velen-Gemenbibl., Balve, Germany, lacks the first four leaves of the first quire (fols. 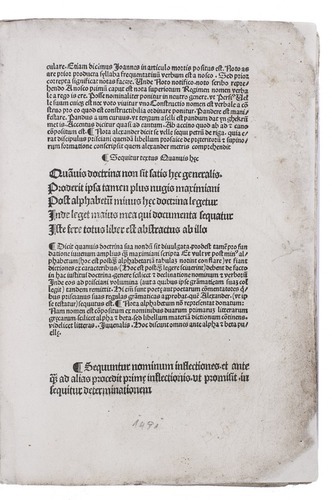 a1-4; the inner lower corner of a4 is still present), including the title-page with woodcut and the prologue. Otherwise in good condition, with some contemporary scholarly annotations in ink. Some pages soiled, margins of first leaves restored. Borm, Inc. Guelf. 92; CA 119; GW 1144; IILC 172 (2 copies, including the present copy); Kok, Houtsneden II, pp. 548-551; Reichling, Doctrinale 88.I.